This interview originally appeared in the May 2015 edition of Berkshire Trade and Commerce (Vol. 19 No. 1). Greg Watson brings extensive public policy experience to his new position with the Schumacher Center for a New Economics. He discusses his views on a wide range of issues in an interview with BT&C. 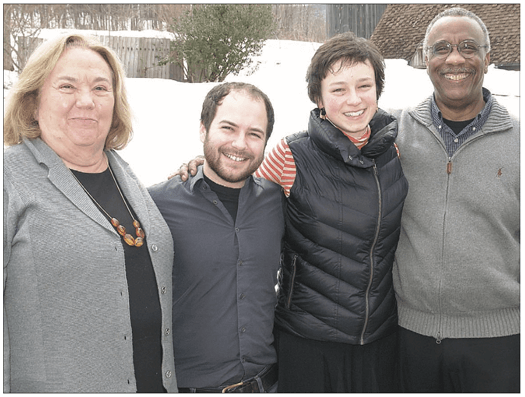 A prominent figure has joined the staff of the Schumacher Center for a New Economics, the Great Barrington-based organization that established the BerkShares local currency, among other projects. Greg Watson, former Massachusetts Commissioner of Agriculture, is the Schumacher Center’s new director of policy and systems design. The Schumacher Center, based at a rural site on Jug End Road in South Egremont, is a nonprofit organization originally founded as the E. F. Schumacher Society in 1980 by current executive director Susan Witt and the late Robert Swann. The Schumacher Center operates a library, sponsors lectures and supports theoretical research and practical application of concepts, such as BerkShares, which is designed to support and strengthen the regional economy by encouraging the purchase of goods and services from local businesses and institutions. According to a press release from the Schumacher Center, as director of policy and systems design, Watson will introduce new programs while linking together the existing educational and applied community economics programs of the Schumacher Center. He will be a public voice for sustainable agriculture, renewable energy, new monetary systems, equitable land tenure arrangements, neighborhood planning through democratic processes, government policies that support human-scale development, citizen financing of new enterprises, import-replacement strategies, and other concepts. Watson, who lives in Falmouth, brings a long career of involvement in these issues to the job. Among other positions, Watson served as a member of President-elect Barak Obama’s transition team for the U.S. Department of Energy. 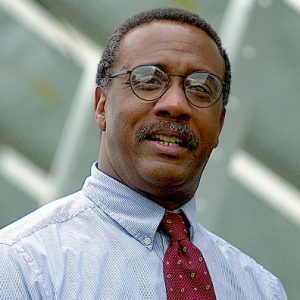 He also previously served as assistant secretary for science and technology with the Massachusetts Executive Office of Economic Affairs, and served concurrently as deputy director of the Massachusetts Centers of Excellence Corporation. for clean energy technology within the Executive Office of Environmental Affairs, he developed a process for assessing the nation’s first proposed offshore wind project. 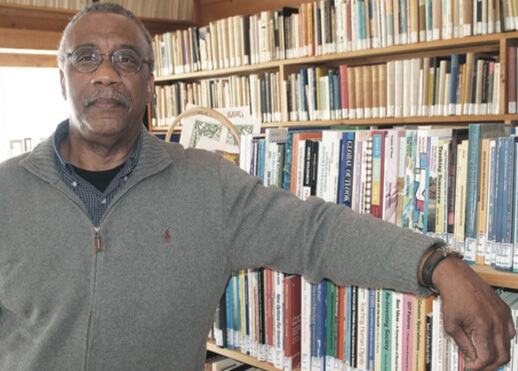 As executive director of the Dudley Street Neighborhood Initiative, he managed a community-based revitalization plan. In the following interview Watson discusses his background and views on a variety of issues. Former Commissioner of Agriculture Greg Watson (right) joins fellow Schumacher Center staff members for a photo prior to the organization’s annual meeting on March 21. They are, from left: Susan Witt, executive director; Sam Willsea, director of college operations; and Alice Maggio, local currency program director. Berkshire Trade & Commerce: What prompted you to take this job with the Schumacher Center? Greg Watson: It’s a natural fit for me. Throughout my life I’ve been involved in activities to encourage and develop new ways of providing the essentials of food, shelter and energy without destroying the natural systems that sustain life. I’ve also been engaged in initiatives to encourage economic practices that better meets the needs of people. Those goals require challenging many of our most basic beliefs and assumptions, and developing alternatives. The Schumacher Center has been doing that consistently for a long time. They also recognize the link between sustainable economics and the environment. I’ve been familiar with the Schumacher Center since the early 1980s, when I first met Susan Witt and Bob Swan. We worked in the same circles and got to know each other over time. Last year, Susan and I were both on a group tour, and she casually mentioned that if I were ever interested in working for the Schumacher Center to let her know. I knew I would be leaving my position with the state. I thought about it and decided to take her up on the offer. That’s the kind of idea that if you described it beforehand, people might say, “You can’t do that. It’s impractical.” But they did it, and created a new model for local economies. Whatever the ultimate impact of BerkShares is, what’s important is that they did something innovative and followed through on it. BT&C: You have worked in many capacities, as commissioner of agriculture, and in state and federal economic development and energy agencies, as well as grass-roots community organizations. Are there common threads that have guided you in your career? Watson: To answer that, I should go back and explain the path I’ve been on throughout my life. It’s been an unusual journey. I grew up in Cleveland in the 1960s. It was an area that was known for its pollution. It was so bad the Cuyahoga River caught fire. So I became very aware of environmental issues, and developed a commitment to work on them, at an early age. But, as an African American, I also felt conflicted. This was in the 1960s during the civil rights movement. Many in the Black community felt that the environ- mental movement was irrelevant. Some were even suspicious that the idea of “limited growth” was actually an effort to distract from – or even to block – the economic progress of the disadvantaged. However, I intuitively believed that the issues of the environment and economic justice were directly related, although I couldn’t explain or articulate it at the time. In looking for answers, I did a lot of reading and studying, and discovered people who offered alternative ways of thinking. Among them was the economist E.F. Schumacher, (the namesake of the Schumacher Center and author of the book Small Is Beautiful: Economics as if People Mattered). He, along with others like Wendell Berry (a farmer, writer and activist) and Jane Jacobs (an advocate for cities) and visionary ecological design scientist John Todd, shaped my thinking because they made connections across different disciplines. They and many other people saw the linkage that exists between social values and economic and environmental systems. I was especially influenced by Buckminster Fuller. His book Synergetics: Explorations in the Geometry of Thinking changed my whole view of the world. He discovered the structures and systems of nature, and applied those concepts to human activity. He is mainly known today for his invention of the geodesic dome. But his ideas were very wide ranging. He challenged the whole way we think about economics, the environment and technology, and offered a different of looking at their relationship. His ideas are more relevant than ever today. BT&C: You said we need to challenge many of our most basic assumptions about economics. What do you mean by that? Watson: We have to reevaluate the concept of the bottom line to include other values in addition to profits. It needs to factor in other impacts of activity, such as environmental sustainability and social and economic equity. We also have to revive the concept of “the commons,” which are the shared resources that are necessary to sustain life and society. We have to think more of the land and air and water as a common resource that we all rely on, and not as something that exists only to be exploited for private gain, or used as a dumping ground for waste. To put it bluntly, we have the choice of surviving by doing wise things or becoming extinct by doing stupid things. And one of the stupid things we can do is to allow our resources to be used for the blind pursuit of greed and power. BT&C: Economic growth is necessary to support an ever-increasing population, and our system is based on private enterprise and private property. Can those be reconciled with what you are saying? Watson: One of the assumptions that we have to reexamine is the idea that never-ending economic growth is necessary and inevitable. E. F. Schumacher identified the difference between economic growth and sustainable economic development. is always occurring. It’s necessary to sustain life. In nature, sustainability of the overall system is the driving force. The earth is always undergoing change and development, with solar energy as the base currency. But development is not about using more resources. It’s based on the wise use of existing resources, and figuring out how to more efficiently do more with less. That is different than thoughtless growth that occurs for its own sake, or the pursuit of profit as the sole goal. The difference between development and growth takes many forms. For example, recycling is a basic principle in nature. Nature is constantly recycling the resources that are available. Something is used, and then it is returned to the system to be used again. Also, the by-products of one system are used as the inputs of another. This is symbiosis. That is in contrast to the way we use resources when growth is the only objective. Too often in our system, we grow by extracting more resources without any concern for the consequences. Resources are used once, and then disposed of as waste and toxic pollution. Our reliance on petroleum, for example, is not sustainable. Fossil fuels are a finite resource, and the way we use them is ultimately destructive to the environment. This has very real consequences. In nature, the overall goal is to protect and renew the systems that sustain life. But nature is not concerned about the survival of any particular species. Ninety- nine percent of the species that have lived on Earth became extinct because they altered their environmental niches in ways that make them uninhabitable for them to continue living. They became extinct and were replaced by other species that adapted to the newly created niches. That continual cycle of natural succession has occurred throughout the earth’s history. We humans are also subject to this pattern. We can undo ourselves by pursuing growth in ways that disregard the consequences. We can make ourselves extinct by continuing to waste resources and desecrate the natural environment. But humans are also the first species that has the opportunity to consciously avoid becoming extinct. We have the potential to participate constructively in that cycle by adapting, if we use sustainable development to survive and thrive by using resources wisely – yes, in harmony with nature. BT&C: However, we have evolved a lifestyle that is based on the use of technology to maintain a basic standard of living for everyone. As we have seen this year, nature is also harsh, and we need to protect ourselves from it. Isn’t it unrealistic to expect that as a society we can give up the advantages of technology and live in simpler, more primitive ways? Watson: That’s not the choice. The notion that technology and nature are incompatible is another one of those false beliefs we have to challenge. It can be part of the solution or part of the problem, depending on how we develop and use it. Technology can either hasten our demise as a species, or it can be a tool that helps us to adapt and better live within the natural world. Buckminster Fuller addressed that directly. He looked at the structural geometry and mathematics and systems that occur in nature, and also compared and applied these natural principles to human activity. He saw nature as the ultimate technology in its designs and operations. The natural world is based on the same principles and systems as technology. Natural systems are basically the earth’s operating system. Fuller also pointed out that the designs and systems of nature can teach us how to do more with less. the shapes of automobiles to objects in nature, and how they can be designed to be aerodynamically efficient. His geodesic dome was another illustration of emulating natural principles to build structures that are strong and efficient. We can see the positive potential of technology today in many ways. Technology is helping us develop ways to do things more efficiently. It has helped us to develop energy sources such as solar power that are based on the effective use of clean, renewable resources, rather than extracting fossil fuels and disposing of them as pollution. The development of computers and online technology is another example. It allows us to share information about innovative ideas and solutions. And, the most important components of computers – chips – continue to get smaller and smaller. The emphasis is shifting from physical hardware to applications. The ultimate impact of all of this will depend on how we use these technologies. While technology can be harmful if misused, it can also provide solutions that will support more people and sustain the health of the environment without undermining the basic systems that support life. BT&C: However, it can seem like we’re going in the opposite direction in many ways, and many people are discouraged. We’ve seen large corporations take over much of the economy, wealth being concentrated into fewer hands, and government and politics being controlled by powerful interests. And these powers have a vested interest in maintaining the status quo. Are you optimistic or pessimistic about the chances for positive change? Watson: I define an optimist as someone who knows that options for successful outcomes exist, but is also realistic and realizes that’s not inevitable. by cynicism and anger, and a belief that we’ve got to create alternatives. There’s no guarantee we’re not going to follow the path of other species and continue to act in ways that will make us extinct. And, yes it often seems like change is unwieldy, if not impossible. Change is very difficult, especially in light of the dominant political and economic systems. But there are many people and organizations working to develop new, more sustainable and equitable ways of doing things. And they are making a difference. I compare them to “trim tabs” on a ship’s rudder. The overall system is like a giant ship moving forward at high speed. Changing its course is very unwieldy, and you have to overcome its momentum to even begin to turn the rudder. But one way to do that is with a little trim tab on the rudder. One only needs a small amount of energy to turn the trim tab. When it turns it creates a partial vacuum which turns the rudder and changes the course of the ship. There are many groups and individuals that are serving as trim tabs out there in society. They can serve the same purpose by helping to change large systems that appear to be unchangeable. And things like the Internet and social media are helping to connect these groups, and enabling people to communicate and spread ideas. BT&C: What are some examples of this? Watson: There are many, and they exist at all levels – from small grassroots efforts, to businesses that are adopting “green” technologies and social entrepreneurship, as well as government policies. We see one example of what is possible right here, in the recent history of farming and the food system in Massachusetts. Between the end of World War II and the late 20th century, we saw the rise of industrialized agriculture and mass-market food system. We saw small farms disappearing and being replaced by corporate factory farms. As a result, in Massachusetts, agriculture declined sharply. By the 1970s, the state was losing farmland at a rate of tens of thousands of acres a year. People said, “Farming is finished in Massachusetts.” It was widely assumed that farmland and the agricultural economy would disappear. It was multifaceted. Among other strategies, it created an option for farmers and other owners of farmland to sell the development rights to their land. They could earn revenue from the sale, while also ensuring that it would always remain available as farmland. This and other policies, and social and economic trends, began to revive farming and food production. It has not been a huge change, but it is significant. We’ve seen the interest and demand and market for regional food increase significantly. More young people are interested in going into farming. buy directly from farmers. The growth of farmers markets and community-supported agriculture has been a major factor in that. As a result, the rate of loss of farmland in Massachusetts gradually began to slow down. According to the 2012 Agricultural Census, Massachusetts was among a handful of states that actually had a slight increase in the amount of farmland since the last census in 2007. It was a small percentage, but it does show how it is possible to make a change in a trend that seemed irreversible. scale industrialized agriculture and mass marketing, those “trim tabs” have made a significant difference. It’s creating the basis of a more sustainable regional food system and agricultural economy. BT&C: You mentioned the earlier tension that existed between the goals of environmentalism and the civil rights and economic justice movements. Economic polarization has become an increasingly important issue, and problems like urban poverty seem to be getting worse. Do you see those being reconciled? Watson: There’s much more recognition of the fact that the overall health of communities requires both economic and environmental sustainability. a very poor section of the Roxbury and Dorchester area of Boston. In the ’60s and ’70s, that neighborhood experienced increasing blight and disinvestment, and a growing number of abandoned properties. It became so bad that landlords burned their properties rather than hold on to them. At one point the city developed an urban renewal plan for the area. However, the residents of the neighborhood opposed it. Rather than revitalize the existing neighborhood, they saw it as gentrification, and a project that would displace the existing population there. The city gave up on the plan. However, the residents also recognized that something had to be done to improve the neighborhood. So they formed the Dudley Street Neighborhood Initiative, a community-based organization, as a grassroots revitalization effort. They also established a land trust, a nonprofit organization that owns land and uses it for housing or other public purposes, including preserving open space. ing the land trust the power of eminent domain. This allowed the community to purchase the abandoned vacant parcels at fair market value. They developed plans to put the properties back into use, and worked with banks and other businesses and civic organizations. On some of the vacant sites they established community gardens and a 10,000 square-foot greenhouse, where residents could grow their own food. They also set up a farmers market. Other sites were earmarked for other common community uses. To encourage rehabilitation of housing on an affordable basis, they worked with banks to provide financing of housing units in buildings on the land trust sites. To prevent speculative investment and gentrification, the agreements limited the resale price of properties for an extended period of time. That’s an illustration of how communities can address these issues on a local level. BT&C: As individuals and society, we tend to take the path of least resistance, and avoid change until it becomes absolutely necessary. As an example, we can’t seem to come to a consensus on climate change. Do you believe we can make incremental changes quickly enough to prevent possible disaster in advance? Watson: There is ample evidence that we are capable of changing ingrained systems into more sustainable ones. One surprising example of this is Cuba. The educational tour I mentioned that Susan Witt and I had taken was to Cuba. I realize the United States and Cuba have many differences, and people have objections to their government and ideology. When I told people I was going to Cuba, they rolled their eyes. But, regardless of what we think of their government, something interesting happened in Cuba that we can learn from. When the Socialist bloc collapsed, the Soviet Union stopped providing Cuba with the petrochemicals and other resources that Cuba had relied on as the basis for their economy, such as their industrialized agricultural system. As a result, Cuba had to find new ways of doing things, without that support. By necessity, they turned to solutions such as organic farming, urban agriculture, and other sustainable methods of growing, processing and distributing food. So, they have become experts at doing things in a more environmentally sustainable way. Hopefully, with the new openings between the United States and Cuba, there will be opportunities to exchange ideas and information with the people of Cuba. Ideally, if we look beyond our conventional ways of thinking, and open our minds and adopt sustainable alternatives, we can choose to make changes before we have lost that choice.